Ok, so by now I have usually gone through tons of Halloween DIY inspiration and started creating new spooky décor for my house. In fact by now I have at least decorated my front porch for Fall. But…. this year I am really lacking the humph to get started, maybe because it is still around 100 degrees here and my lovely rose bushes and butterfly bushes have now died. 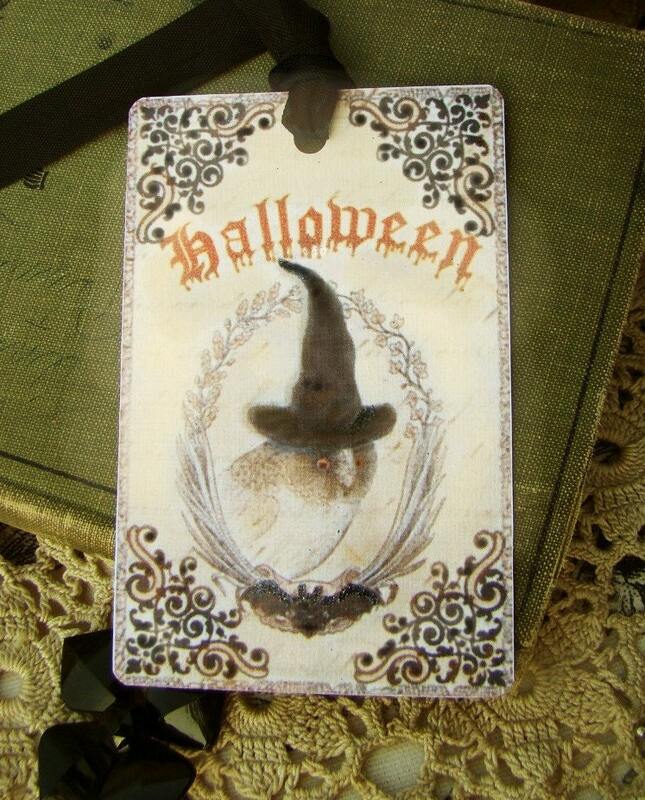 But, at least I have created a few chic Halloween celebration items for my Etsy Shop, inlcuding fun Spooky Chic Gift / Hang Tags and one of a kind assemblage jewelry pieces. 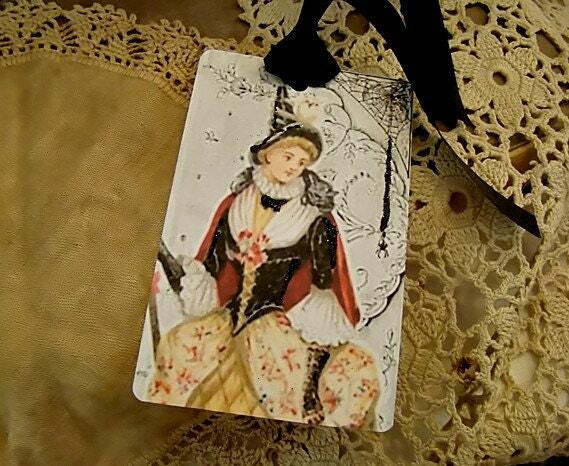 Elegant Victorian Witch Spider Chic Gift Tag Set Vintage style witch collage gift tags featuring antique ephemera of an elegantly dressed Victorian witch with her friends the black cat and white owl, with a little black spider coming to sit down beside her. Images are set on a background of antique Brussels lace. 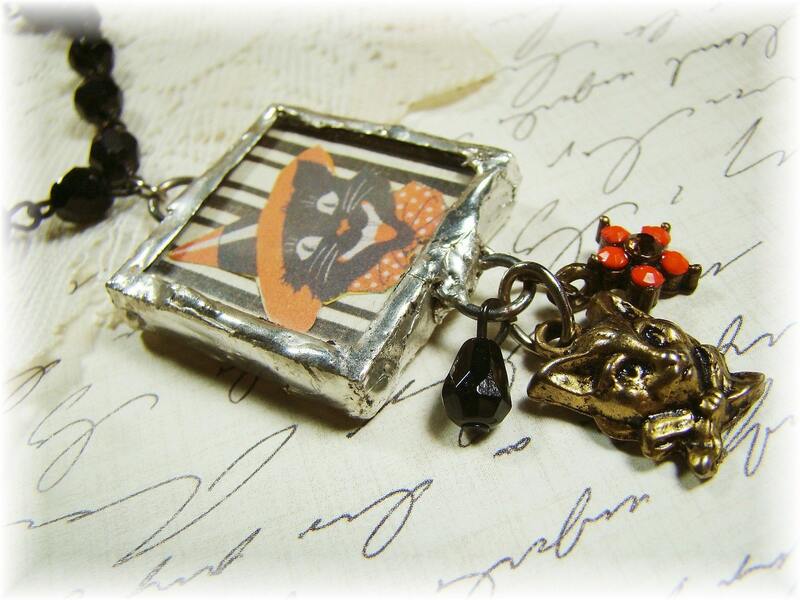 Fancy Halloween Bat Collage Assemblage Necklace ooak Fun and one of a kind Halloween Bat Necklace. 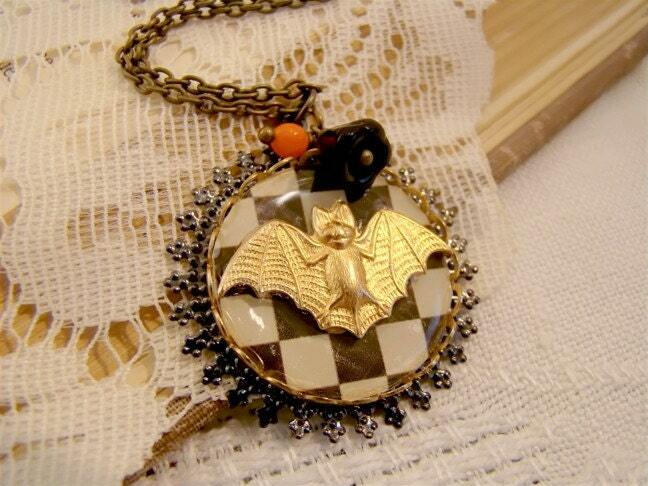 Pendant is created with an adorable, highly detailed brass bat set on a black & white checkerboard round resin cabochon set in layers brass lace edge setting and lacey black Victorian filigree. Pendant is accented with a vintage jet black glass bell flower and tiny orange glass bead. Hedwig Owl Victorian Collage Gift Tag Set Vintage Ephemera Collage Halloween gift tags, featuring a vintage owl wearing a wizard or witches hat set in an ornate frame with a friendly bat, ornate black filigree, a spooky orange Halloween set on an aged sepia toned background, with hand applied black glitter accents. Retro Halloween Black Cat & Lace Soldered Charm Necklace Retro Vintage Halloween Black Cat assemblage Necklace, created with a two sided soldered Halloween pendant, featuring retro black cat ephemera, a jet black glass bead rosary chain, antique black lace, vintage brass cat charm and a vintage orange rhinestone flower drop. So adorable! Love all your Halloween creations. Your shabby chic vintage style is fabulous!